Kuriakose (Cyriac) Chavara was born in 1805, of pious and devout parents of Syro-Malabar Church, in Kainakary, Kerala, India. In baptism he was given the name Kuriakose (Cyriac). After his early schooling in the native village and priestly Blessed Kuriakose Elias Chavara Blessed Kuriakose Elias Chavara studies under Fr. Thomas Palackal at Pallippuram, he was ordained priest in 1829. In 1831, co-operating with Fr. Thomas Palackal and Fr. 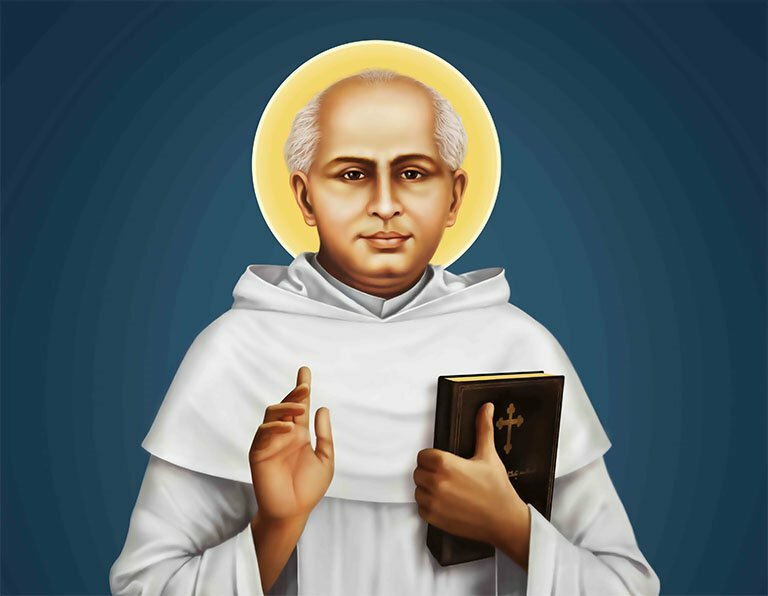 Thomas Porukara, he founded the first indigenous religious congregation for men, now known as the Carmelites of Mary Immaculate (CMI). It was after the death of the senior companions in the foundation, that Fr. Kuriakose with the first members, made the religious profession in 1855. It was after the death of the senior companions in the foundation, that Fr. Kuriakose with the first members, made the religious profession in 1855. In religion, he took the name Kuriakose Elias of the Holy family. Starting seven religious houses, besides the first one at Mannanam, in different parts of Kerala, the new congregation made great strides in the spiritual renovation of the Syro-Malabar Church. Seminaries for the education and formation of clergy, introduction of annual retreats for priests and people, a publishing house for the propagation of Catholic doctrine, a house for the dying and destitute, special attention to catechumens, schools for general education, were among the various activities under Fr. Kuriakose Elias’ leadership. Many valuable improvements in the Syro-Malabar liturgy were largely to his credit. In 1866, with the co-operation of Fr. Leopold Boccaro OCD, he started the Congregation of the Mother of Carmel (C. M. C.) for women. A schism threatened the church in the area in 1861, creating a very critical situation. Fr. Kuriakose Elias Chavara, the then Vicar General of the Syro-Malabar Church, is gratefully remembered and acknowledged by the then and later leaders of the church and by the Catholic community in general, for his strenuous fight, strong stance and effective leadership in thwarting Thomas Rochos’ intrusion and saving the Church in Kerala from schism. Amidst diverse and manifold activities, he found time and leisure to write a few books, both in prose and in verse, for the benefit of the faithful. His counsels to the Christian families given in the form of the “Testament of a Loving Father” are universally applicable and are relevant to this day. Essentially a man of prayer and intense charity, he stayed in close communion with the Lord amidst his several religious and social activities permeating his spirituality to all around him, so much so that he was accepted and referred to as a man of God, from his early years. In 1871, on January 3, Fr. Kuriakose Elias Chavara, after a short but painful illness, died at Koonammavu, preserving his baptismal innocence. His mortal remains were later transferred from Koonammavu to Mannanam in 1889 and are reverently kept in St.Joseph’s monastery church Mannanam. The Archbishop of Changanassery inaugurated the diocesan process for his beatification on January 3, 1958 at the request of late Fr. Maurus CMI, the then Prior General. The Sacred Congregation having scrutinized the writings of the Servant of God and other relevant documents formally introduced the cause on March 15, 1980. On April 7, 1984, Pope John Paul II solemnly declared the heroic virtues of the Servant of God elevating him to the status of Venerable. On February 8, 1986 during his historic visit to Kottayam, Kerala, Pope John Paul II raised Venerable Kuriakose Elias Chavara to the honours of the Altar declaring him ‘Blessed’.